NAIROBI, KENYA, January 10, 2019 /EINPresswire.com/ -- Merck Foundation, the philanthropic arm of Merck Germany partners with Egypt’s National Cancer Institute to provide Master Degree in Medical Oncology for African doctors. This initiative is a part of Merck Foundation’s ‘Merck Cancer Access Program’ that has been initiated by the Merck Foundation to increase the limited number of oncologists across Africa. 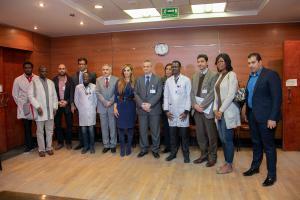 “I strongly believe that building capacity by having trained Oncologists in each African countries is pivotal, since lack of professional skills is the key challenge in Africa and developing countries.” Dr. Rasha Kelej added. Prof. Dr. Hatem Ahmed Aboulkassem, Dean of National Cancer Institute emphasized, “The scarcity of trained healthcare personnel capable of tackling prevention, early diagnosis and management of cancer is a bigger challenge, and therefore, this partnership will prove to be very beneficial for many African countries”.